A "bird buggy" designed by the compassionate owner of an African grey parrot seems like an ideal way to get around, if your wings have been clipped. 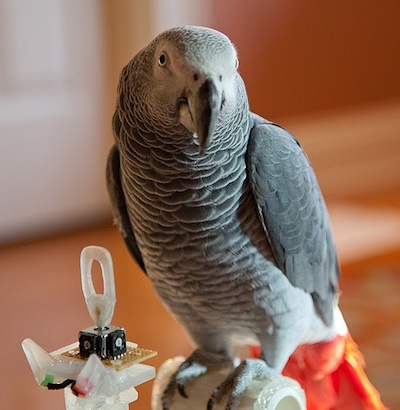 Basically, this toy is a parrot perch on wheels, equipped with a joystick that allows its parrot driver to commandeer the contraption around the house and with a newspaper-sized deck to catch Pepper's occasional tokens of appreciation. Dubbed the "bird buggy" by Mr Gray, this robot is the most sophisticated toy that Pepper has received so far. It meets his goal by allowing him to follow his much larger and clumsier human family members around the house without fear of being trampled underfoot.